The Rivers State Chapter of the All Progressives Congress (APC) has applauded the appointment of Minister of Transportation, Rt. Hon. Chibuike Rotimi Amaechi, as a member of the Board of Trustees, United Nations Institute for Training and Research (UNITAR), even as it hailed the choice of Amaechi as the 2015 Igbo Man of the Year by the Pan-Igbo group, Ohanaeze Ndigbo. 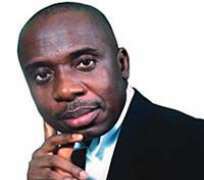 Rivers APC in a statement signed by its Chairman, Dr. Davies Ibiamu Ikanya, described Amaechi as God’s gift to Nigeria, saying that the honours are well deserved. The party said in the statement issued Sunsday in Port Harcourt: “The appointment of Rt. Hon. Amaechi as a member of the Board of Trustees of UNITAR for an initial three-year term from January 1, 2016 to December 31, 2018 did not come to us as a surprise knowing the antecedents of Amaechi as a great achiever. It is well deserved by the man during whose tenure as Governor, the Rivers State capital, Port Harcourt, became the first African city to be declared The UNESCO World Book Capital in 2014, out-bidding other great cities such as Oxford in England and Moscow in Russia, among others.